Last updated 07 September 2018 . By Faith Strickland. Mashing together the shop-bar-restaurant concept, Bottles is a new chilled drinking spot in Spitalfields. My first foray into red wine was while on a year abroad in southern Italy. To get over the mind numbing boredom of living in a tiny, mountain town, my friend and I would slosh our way through a 2L bottle of lambrusco - fizzy red wine to the unaware - before heading to the one bar. 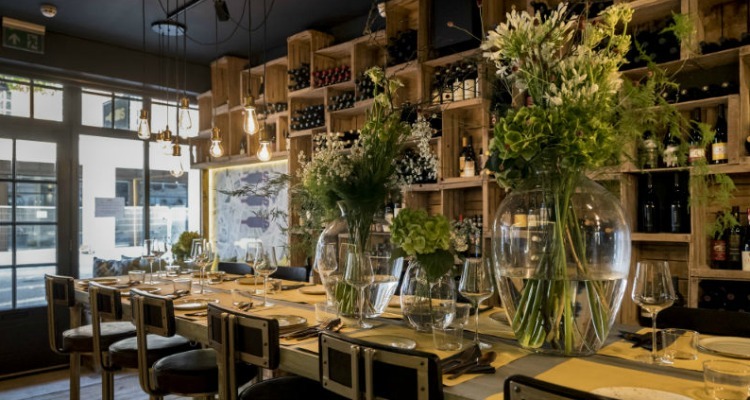 Now I’m a proper adult, at least in terms of age, I feel it’s time to revisit the wines of Italy; step up Bottles, the new Spitalfields wine bar that’s doling out biodynamic Italian wines in stripped back settings. With one eye on the street and one eye on the market, Bottles adapts to its location, merging a shop concept with a bar. On the top floor - where most of the early evening punters seem to be sat - old, carefully stacked wine crates hold various bottles, and a long communal wooden table sits under low-hanging lights. The wine isn’t just for decoration, there’s also a huge list, and if you’re going for the entire bottle, it’s even longer, split between various regions. I went for a glass of Montepulciano D’Abruzzo Valle Reale 2017 (£8 for 125ml), a fruity, musty wine - as warming as a winter bubble bath. Food is from Sood, which has taken over the downstairs basement bar, while still serving upstairs. It’s a short, very Italian menu, with nibbles including olives and charcuterie boards - though if you’re peckish, do go for one of the plates. With an ex-Chiltern Firehouse senior chef at the helm, the meals are thought-out and properly tasty; my handmade spaghetti all’amatriciana (£14) was a cheesier, more gluttonous take on the classic, as tomato sauce is thickened with heaps of pecorino cheese and bacon bits. There's no denying that Bottles does come with a bit of a price tag, but for people who actually know what 'corked' means, the selection of wine will be worth it. If you're looking for a third-date kinda night or have got the company credit card, head to this slick and sociable spot for wine that will impress, and plates that will have you sticking around. Bottles is open on 67 Brushfield Street, London E1 6AA.